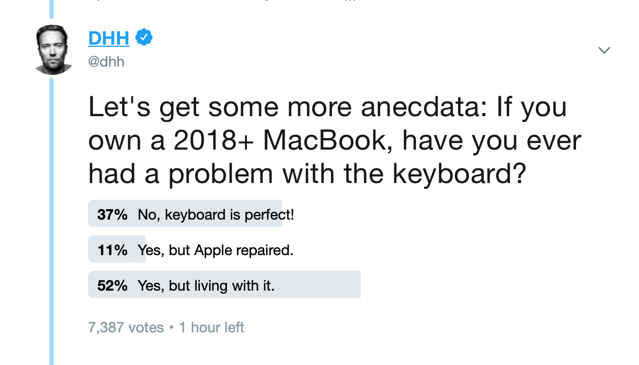 Last week, while Apple officially acknowledged continued problems with its third-generation butterfly keyboard, it did so by saying that only a “small number” of MacBook customers are still experiencing reliability issues. However, it seems the issue is actually huge and is only getting worse and not better with time. According to David Heinemeir Hansson, the creator of Ruby on Rails and founder and CTO at Basecamp, he points out that the reason why Apple keeps saying it’s a small issue is that most people simply do not contact Apple when their MacBook keyboards fail. They either live with the stuttering keys or just start using an external keyboard. Since Apple never gets to see these cases, they never get included in its statistics. 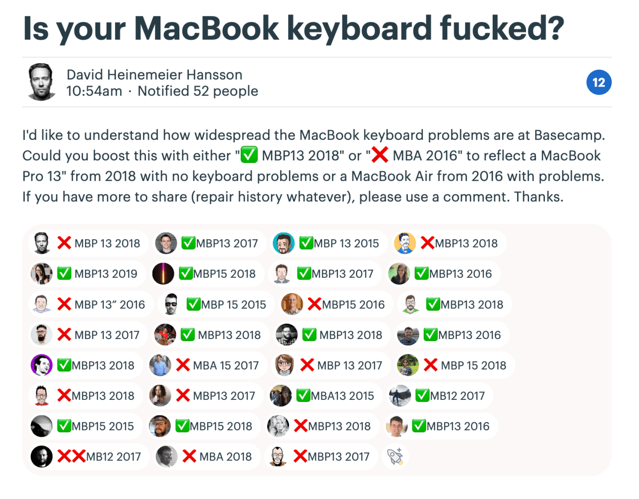 To prove his point, the author sampled 47 MacBook users at c company called Basecamp, out of which a staggering 30% were found to be dealing with keyboard issues. And that’s just the people dealing with current keyboard issues. If you include all the people who used to have issues, but went through a repair or replacement process, the number would be even higher. I backed up those figures with a Twitter poll that has over 7,000 respondents already. That’s a 63% failure rate!! But Apple is only seeing 11% of those. 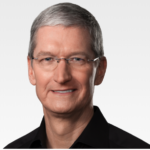 Well, do you think Apple will finally acknowledge it is shipping broken computers in mass quantities?